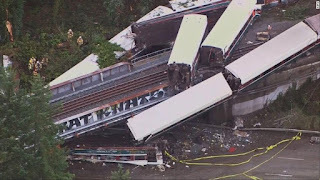 The traffic derailment of the Amtrak train in DuPont, Washington on its first Seattle-Portland run is full of spectacular ironies, the main one being that the fall of some of the train's cars onto Interstate 5 caused massive disruptions on the very transportation network - our interstate system - that Amtrak is meant to relieve. The lack of positive train control on the train called for more investments in our transportation infrastructure, yet the track itself was newly installed, and, as noted, this train was on its maiden run. The facts on the ground, however, only illustrate how little attention we pay to our intercity passenger trains. The speed on this track was a mere 30 mile per hour, which meant that trains couldn't go too fast. Other countries have trains that go at least four times as fast, but the track on this connection between the two most important cities in the Pacific Northwest couldn't handle even thrice that speed; the train derailed at an 80-mph speed. The track was new, but the technology clearly wasn't. And the new technology that was needed the most wasn't in place to ensure people's safety. And here's a more direct look at that trestle over I-5, from November 2016. 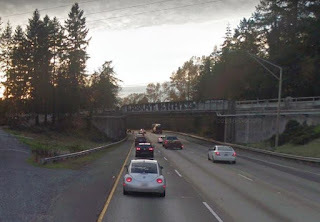 This picture gives you a less encumbered look at the graffiti on the overpass, symbolizing the blatant disregard and lack of respect for our national passenger train system. And after all of this, three passengers on that train are dead. Trump wants to spend money on infrastructure, and he hopes to have a plan to introduce sometime in 2018, but if you're a railfan, don't hold your breath. Even if Republicans actually agree to any spending on infrastructure, Trump, despite his New York City roots, isn't likely to increase spending on passenger rail, because Republican lawmakers outside the Northeast and California have zero interest in upgrading and modernizing Amtrak. Indeed, they've spent the past 35 years trying to get rid of it, and this accident gives them an excuse to cut the very funding Amtrak needs to get positive train control installed system-wide.